Another outfit post today! Sunday was such a lovely day, the sun was shining and it was really fresh out so we went to Sussex to visit my boyfriend's Mum, so no dim sum for me this week boo, however I was made seaweed and egg soup... something I have never had before. I am not sure why but recently I have really been struggling with what to wear at the weekends, as the weather is changing so much from artic conditions to mild, I never know what to wear I think I need to buy more layers! I also feel a bit in a style rut and like I wear the same things over and over again. 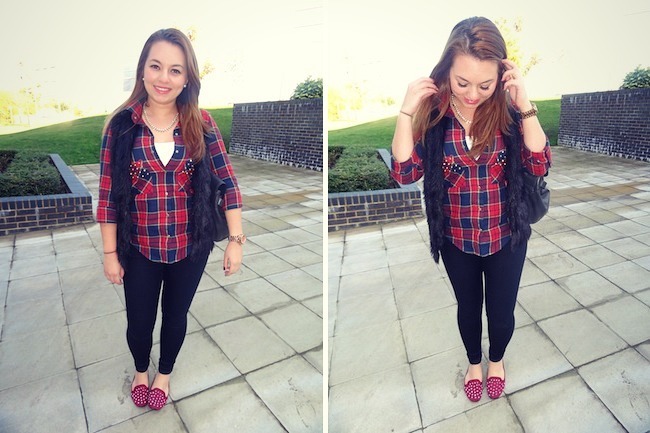 Anyway I dug out my studded checked shirt which I got quite a while ago but recently I have noticed it has become pretty popular within the blogging community. Now this outfit is not ground breaking but I mean there is only so many ways you can wear a checked shirt in winter... with jeans! I just added my trusty fur gilet over the top, and this outfit was actually really comfortable perfect for travelling on the trains! Is anyone else stressing about Christmas yet? I really should start buying present soon, I also have my boyfriend's and best friends 21st birthdays at the beginning of February so its is going to be an expensive time I really need to get organised! P.s someone else at work just saw me writing this so knows about my blog, I have gone VERY shy ha anyone else get like that when 'real life' people find out?